There’s going to be a couple of topics that will keep resurfacing through the years on Spontaneous Lunacy, usually when the artists, producers and labels in question fail to deliver in the area in question and we call them to task on it, so be forewarned. One of these pet peeves is the role of the B-side and how so many companies failed to properly utilize it to expand the artist’s scope, diversity… or sometimes their finances. So it’s nice that fairly early on in this journey we get an example where things were handled right to show how they should be done. We’ve delved into this a bit already on Jimmy Liggins Troubles Goodbye, but in case you’ve forgotten or don’t want to go back and re-read it (and if not, shame on you, it was really good), the gist of it was that back in the day when singles had two songs, rather than one, the B-side had a couple of obvious – if seldom used – advantages. The first consideration should’ve been musical, IE. “let’s show off some aspect of our skills that wasn’t evident on the top side”. In other words pair a ballad with an uptempo song. If it was a singer who was also a musician, let them do an instrumental on one side and a vocal on the other. In groups with multiple singers why not let someone who spends more time in support of the established lead handle the flip side, or at least give them a prominent bridge to sing on one side, thereby massaging their ego a bit and letting them feel a little more useful than just singing the wordless “Hmms” and “Ahhhs” or “Oooohs” in the background. The Ravens more than most did so to great effect, letting Maithe Marshall handle leads instead of Jimmy Ricks on material better suited for him, or in maybe the best case we’ve come across thus far, giving Zeke Puzey the reins on Be I Bumble Bee Or Not. Not only does it keep each member of the group feeling needed, it also forges a deeper connection with the fans so that individual personas emerge for them to gravitate towards. The other option, as we see here, is to turn the writing chores over to someone in the group themselves, especially when the majority of the top sides are either written by outside talent or are standards culled from the great American songbook. As we’ll see over time record companies were rarely so altruistic as to be giving artists another source of income. In fact let’s be honest, they were more likely to discourage, even steadfastly deny the mere acknowledgement of songwriting royalties back in the day. If the company was forced to pay royalties to someone it’d be far better to give them to the heirs of whatever corpse wrote it decades earlier, or better yet, to make up a name and claim writing credit for themselves rather than to let on that the guys in the group who wrote the song were entitled to more than the $42 they gave them for singing the tune! Because once they know they can actually get more money that’s when they start expecting and demanding it, and if you’re a record label surely you know that no good can come of THAT! Yet here we are with The Ravens getting a writing credit and not a moment too soon either. Following a schizophrenic run in 1948 with releases alternating between bland offerings done in a watered down pop style apparently trying to crossover to the supposed more worthwhile white adult audience, and the type of groundbreaking vocal harmony exercises that defined that avenue of rock during the first year and which were met so rapturously by their core audience, it’s refreshing to find that they themselves were aiming for the latter when they were the ones coming up with their own material. Howard Biggs, their pianist and musical director who doesn’t get nearly enough credit for their success, co-wrote it along with lead singer Jimmy Ricks and basic familiarity with the year in question shows where they likely came up with the title, as On Your Merry Way was a hit film starring old friends Jimmy Stewart and Henry Fonda which was released in the early months of ’48. As for the song they built out of that inspiration Be On Your Merry Way is a perfect distillation of all The Ravens had been at their best up until now and somehow manages it without overtly emphasizing their most prominent traits for shock value as we’ve otherwise come to expect. Though Ricks handles the lead in his stentorian bass, which obviously is their biggest draw and what they made their name on, it’s done in a rather relaxed fashion throughout the proceedings. There’s no dramatic entrance like so many of their earlier sides (much of which worked to great effect of course) and no radical contrast seen by switching off between Ricks and the stratospheric high tenor of Maithe Marshall. Instead what we get is a group so in command of their faculties that there seems to be no strain, no effort in attaining the sound they’re after, yet nailing it with ease all the same. Structurally it’s very straightforward, the urgency in the vocals rendering the feel of it a little more mid-tempo than it really is, but for the most part there’s no frills here. There’s a brief call and response with the others on the first stanza, the higher voices responding to Ricks’ opening query “Well I wonder” with a serene “Why do I feel this way-ay” before handing it back over to Ricks to convey the story while the others harmonize unobtrusively in the background, adding a velvet pillow for him to rest his weary head upon. Biggs’ piano doesn’t intrude, though there’s a few brief spaces for him to increase the tension that I’d like to have seen him take better advantage of, specifically those moments right after Ricks ramps things up with a more pressing sense of desperation. A few two fisted chords would’ve worked wonders there before settling back into the languid pace it’s all built upon. But that’s nitpicking. Though the arrangement is simple we’re offered plenty to keep us occupied, from a neat guitar figure snaking its way through early on to Biggs coy use of the treble keys at times. But mostly they stay out of the way for the vocals which carry the tune with confidence and class. On one hand I suppose you can say there’s nothing special happening here, no giant leap forward in their approach, no stretching out to try and show they can pull off something radically different, but there’s also no missteps either, no ill-advised stab at a pop crossover by toning down their deliveries, no frilly melodic intrusions to undercut their vocals, no overreliance on the more extreme attributes of Ricks to sell this in a gimmicky way. No, here they just let his natural languorous delivery, which is a perfect match for the downbeat storyline, handle it as he sees fit and the results are perfectly judged, showing to one and all that they knew exactly where their strengths lay and how to best utilize those strengths without overreaching. It’s a self-awareness that, truth be told, I was beginning to question when listening to their handful of stylistic missteps the past few months. With Be On Your Merry Way as evidence the blame for those earlier misfires would seem to fall at the feet of those choosing their material for broader commercial aims. If you were to try and come up with a song that best reflected the unique style The Ravens offered Be On Your Merry Way would suffice as well as any. Ricks voice out in front expressing a deeply held emotion – in this case sorrow and conflict at the lack of true love from a girl he wants who is indifferent to his efforts – while the others sympathize with him expressively with just their wordless presence. The escalating despondency makes this far more urgent than the unhurried tempo of the melody would suggest, offering a lesson in how to get the most out of an arrangement without artificially inserting anything that would take away from the underlying mood. It’s just really well-conceived and executed all around. Even so I can see why this was deemed a better B-side than something to promote on its own. It doesn’t scream HIT in an immediately evident way (that it BECAME a hit shows that the audience were completely in tune with them and appreciated the same things we do now). But it’s not gonna grab you by the ears, its charms are simply more subtle than what record labels generally want to push. Of course part of it seems to be the session itself was a bit of a rush job so they could get their cover of It’s Too Soon To Know down on wax, as the turnaround from cutting it to releasing it took only a few days. That was the song they were there for after all and there was no way it wasn’t going to get top-billing, no matter what else they came up with. But though they had enough unreleased sides to draw from for something to pair it with, this was unquestionably the better choice to include as the flip-side, not only offering something to reward Ricks financially (should they actually give him the royalties, and I’d be truly shocked to hear that he ever got more than a few pennies in that regard), but also engendering some goodwill amongst the group perhaps for letting them cut something that one of them had a hand in, not simply forcing them to do their bidding when it came to deciding what songs they should record as often is the case. In time of course that type of decision would be taken out of the label’s hands almost completely, as down the road artists became ever more knowledgeable about the intricacies of the business, as well as far more in control of their own artistic vision and determining how they were presented. But in 1948 it was still a rarity (heck, in 1958 it was still a rarity for that matter!) and so for no other reason than that it’s nice to see a case where the artist wasn’t simply an afterthought on their own record. But even were that not the case, even if this was a song gotten from an outside source that they had no say in selecting, the fact that as a SONG it represents everything The Ravens did so well and why they were such a commanding presence on the scene in rock’s first few years is what makes it so special. Be On Your Merry Way might not have been the very best thing they’d done to date but you’d be hard-pressed to say this wasn’t among their most emblematic records. It’s fittingly ironic that that while on the A-side they were being asked to replicate the work of someone ELSE, on the flip they were showing why such a request was foolhardy. The simple fact was nobody sounded as good as The Ravens when they were simply allowed to be The Ravens. 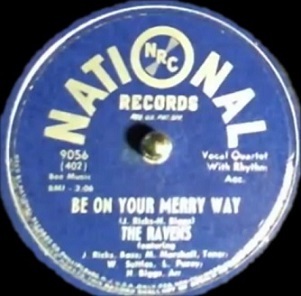 Leave a reply on "The Ravens: “Be On Your Merry Way”"